The "Historic Area of Willemstad, Inner City and Harbour, Curacao" is an outstanding example of European colonial history in the Caribbean. It combines Dutch town-planning and architectural traditions with local influences. The first buildings were designed in traditional Dutch brick style. In the 18th century the so-called Curaçao Baroque architecture evolved, with a curved gable such as the Penha Building. My assessment of Willemstad passed through a number of phases during our visit and certainly finished “higher” than it stood at some stages during the day we were there! However the initial view from the sea as we entered by ship was perhaps the highlight – it is certainly memorable and seemed to augur better for things to come. The Queen Emma pontoon bridge quirkily “opened up” to let our boat enter a narrow waterway (around 150 metres wide? ), lined on both sides by brightly painted houses of vaguely Dutch design – the entire view is framed beyond by the slim high level Queen Juliana bridge linking the 2 sides. Beyond however lies a large and ugly oil refinery and freight shipping terminal. The inscribed old town is in 3 sections, divided first by the main N/S waterway, with another smaller “canal” at right angles creating a third sector on the main (eastern) side. All 3 are walkable within half a day. Our ship moored at “Otrabanda” ( = “the other side”) and we started there. This is the less “showy” and busy side and has a few pleasant buildings and quiet courtyards, but also has some undistinguished areas and an elevated road from the new bridge running through it, together a large modern resort development at one end. The old Riffort which adjoins this has been turned into a restaurant and shopping arcade within the shell of its walls. The hotel has nice a/c and free wifi (as well as such essentials as an infinity pool and a casino!) and is constructed reasonably sympathetically with pastel walls matching the general Willemstad theme, but it reminds you that you are very much in Americanised “Caribbean resort” territory!! Perhaps the best thing about Otrabanda is the view of Punda on the other side and of the pontoon bridge. This is pedestrianised and a “short” partial opening for small boats is indicated by a yellow flag, whilst a long one for ocean going traffic has a red one. During the red flag a free ferry operates and is quite fun to ride. As you cross the bridge you get views of the government buildings and of the most striking block of buildings facing the harbour (photo). One of these, the Penha building, is dated 1708. But closer examination reveals that some of the other structures are modern ones and, as one moves away, one enters streets of pretty non-descript or even poor quality buildings. Occasionally there is a notable building like the Synagogue dating back to 1732 but the main impression is of loads of Gem shops and other tourist traps of no merit, together with areas needing some TLC – I noted particularly a ruined art deco cinema called “Cinelandia” . The Government area has some nice 18th century buildings and a church (which is “pay to enter” – as is nearly everything in Willemstad!) and leads through to the walls of Fort Amsterdam which consists solely of restaurants. Another of Punda’s tourist attractions is the small, so called Venezuelan, floating market selling fish, vegetables and handicrafts but hardly worth a stop. If you cross the canal north of Punda by the modern “Dutch style” pedestrianised lifting bridge, you enter the third sector of the city called Scharloo. Large areas of this former Jewish merchant area are very run down or even collapsing but money is also being invested in what could potentially be a very nice area to live and do business in. It was here that our spirits were lifted somewhat by the sight of some fine and well restored mansions. At the time of our visit some of the streets were still unpaved and drains etc were being laid – no doubt in a few years it will be fully restored but, in the mean time, it is still well worth visiting. So, what overall assessment can be made of Willemstad? Its obvious “comparator” is the other “Dutch” Caribbean WHS of Paramaribo. In my view this latter is more worthy of a visit both for its early “Dutch” official buildings and for its Caribbean architectural variation on the “European” theme which, with its emphasis on wooden architecture, is more striking than that of Willemstad whose distinctive attractive “pastel” shades are perhaps not quite enough to make it “outstanding”. 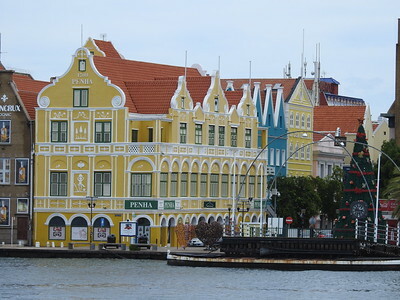 Its location in Surinam also means that is has avoided the commercialization of Willemstad and has maintained a larger area of authentic buildings. Interestingl,y both are inscribed on criteria ii and iv (Interchange of Values and Significance in Human History) but Willemstad is also regarded as meeting criteria v (Outstanding example of Human Settlement)!! The justification for such a difference escapes me! 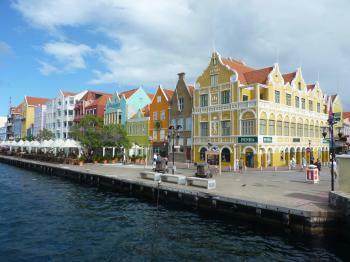 I live in Willemstad, Curacao. I was born here and i love it. It has the most beautifull beaches and when you wake up in the morning you can hear our beautifull birds singing. you should definitly come and visit our gorgeous island. Slavery: Willemstad Curacao was one of the largest slave depots in the Caribbean, though, as it lacked a large scale plantation economy, the majority of slaves were transhipped via camps outside Willemstad. A private anthropological museum with significant emphasis on the Slave origins of Curacaoan culture has been set up in the Ijzerstraat area at "Kura Hulanda" which is said to be "situated on the site of a former slave yard and merchant's home". Built in the 17th century: It was established as a trading post by the Dutch West India Company in the early 17th century. Oldest fort (Fort Amsterdam) dates from 1635.